Based on the hit T.V. series. Jim Phelps was sent to Prague for a mission to prevent the theft of classified material. His wife Claire and his trusted partner Ethan Hunt were members of Phelps' team. Unfortunately, something went horribly wrong and the mission failed, leaving Ethan Hunt the lone survivor. After he reported the failed mission, Kettridge the head of the agency suspects Ethan of being the culprit for the failed mission. Now, Ethan uses unorthodox methods (Which includes the aid of an arms dealer going by the name "Max") to try to find who set him up and to clear his name. 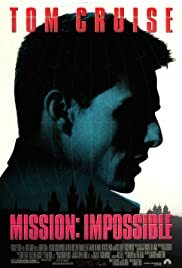 Based on the TV show of the same name, Brian De Palma's stylish thriller stars Tom Cruise as Ethan Hunt; a James Bond-esquire secret agent working for a certain section of the government. As the title suggests, many of the scenarios in the film are extremely unlikely; but then again, the film wouldn't be living up to it's title if they weren't. It's one thing to criticise it's stunts for being overblown, but if they weren't, critics would be on it's back and calling it things like 'Mission Possible', so really you've just got to go with it. Brian De Palma makes it easy to just 'go with it' by way of an intriguing plot line, a constant array of high-octane sequences and lots of his trademark style! The plot does get a little too convoluted for it's own good at times, and sometimes it's a little hard to follow; but it gives the film a good basis for all manner of impossibilities, so it serves it's purpose. We follow Ethan Hunt and his team. After a botched mission, Hunt finds himself on the run from his employers after being accused of disloyalty. Hunt must now pull out all the stops to stay one step ahead of his pursuers and get to the bottom of why their mission went wrong.